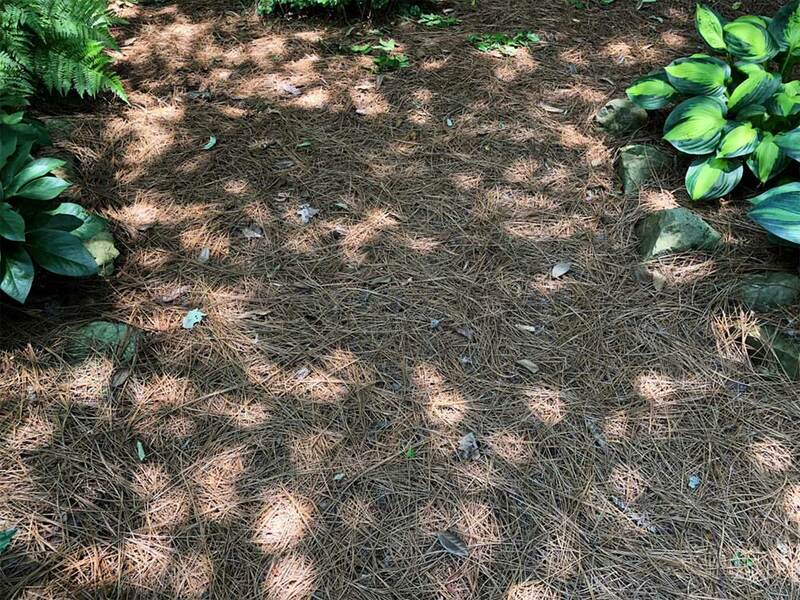 Do you need to figure out what type of shade garden you have? We'll help you do that here. Confession of Shady Wrongdoing: I've planted a Hydrangea macrophylla (bigleaf hydrangea) in the exact wrong shady spot before. Ever since those crispy leaves - due to my planting a BloomStruck hydrangea in dry shade, then forgetting to water it - I've paid close attention to shady activities. Determining your shade gardening situation takes a little bit of study, both in reading what others have to say about shade, then in spending time outside hanging out with your plants in shady spots. If you have a home on land with no trees, you probably still have a little bit of shade - that being on the east, north, and north-east side of your home. Skip on down to the section on "building shade." Some intense examples of full sun are a bermudagrass sports field, a vast parking lot dotted with crapemyrtles in planting islands, or a tomato farm. That's all day, sunup to sundown, full sun. To put a clock on it - that's at least 8 hours of full sun, possibly as long as 10-12 hours around summer solstice in a vast open field. Some of us have full blazing sun like that and there are lots of plants that love full sun, but covering that ground (avoiding puns is hard!!) is not the purpose of this article so I'll move on. Let's move on to partial sun or partial shade garden situations. These terms are used interchangeably, along with half day sun or half day shade. What these terms mean is that for half the day your garden is in the shade and for the other half it's in full sun, with no shade at all. Partial shade in half-day measures is created when you're gardening on the edge of woodlands or it's the shade cast by a building. If the woods/buildings are on the east side, then the trees/structure are providing morning shade. If the trees/structure are on the west side, then they are providing afternoon shade. It's important to know if you're getting morning sun/shade or afternoon sun/shade. Some plants are super finicky about this! Before noon, the sun is gentler on human skin and shade-loving plants alike. The sun increases in intensity up until around noon (in high summer) when the sun is directly overhead. After noon, the sun is strong and in full glory. Protect yourself and your shade-loving plants from the mighty afternoon sun. For Mike and me in Zone 8a, that's from about noon to 6:00. Take Hydrangea macrophylla (bigleaf hydrangea) - it likes morning sun and afternoon shade in the Deep South. If a mac gets afternoon sun, they wilt pathetically or get sunburned or the dreaded leafspot (Cercospora hydrangeae) disease shows up. Cercospora is an aesthetic nuisance, it doesn't really harm a hydrangea, but it's another way of letting you know your hydrangea bush is getting too much sun. If you're looking for a home for your new plant and it's listed as "partial shade to shade" (say Solomon's seal or, again, bigleaf hydrangea) - assume it's meant to be morning sun only and be sure to make sure it's sited in afternoon shade. Morning sun is not as harsh as afternoon sun and many shade plants can transition to morning sun and even benefit from it. If you're planting a plant that's listed as "fun sun to partial shade" (say, black-eyed Susans) you can possibly get away with morning shade and full afternoon sun. The afternoon sun in the Deep South is, in my opinion, that strong and able to satisfy full sun requirements. Most full shade plants don't need any more shade than dappled shade. Dappled shade provides enough shade and respite from the sun as the light passes through leaves and branches and alternates with moments of shade. Dappled shade is my favorite type of shade. It's the shade of forests - pines, hardwoods, and mixed pines/hardwood. It's soothing, moody, transitory, and elusive. There's an art to planting in dappled shade - sometimes there's an opening in the trees and too much sun is reaching your shade-loving plants. When you figure that out, it's time to get out the shovel and re-site the plant to a shadier spot. Alternatively, that extra opening in the trees may be just the horticultural method needed to stimulate your hydrangea into glorious blooming. Pines provide a very bright form of dappled shade. 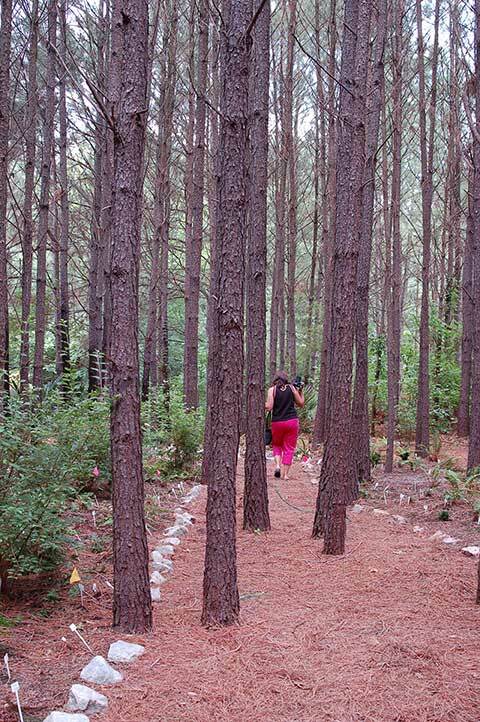 Many plants love pine shade - hydrangea, azaleas, calycanthus, dogwoods - tons of our native plants - even some lawns do well in pine shade (Centipedegrass). Also, pines are self-mulching - all those pine needles provide the pinestraw mulch your non-pine neighbors have to pay for. Pines provide this exquisite bright-but-filtered light, with the downside being you have to deal with the pines - pinecones galore and potential hazard if the pines lodge over. Even with the potential hazards, I can't help but say it again - the shade they provide is very conducing to growing plants. If you've planted under deep shade - it's possible to create more light my limbing up the branches so you've got "high shade" rather than "low shade". High shade provides protection from sunlight when the sun is directly overhead. When the sun is lower on the horizon - in the morning and late afternoon - direct sun often shines under the high branches. High shade is also nice shade conducive to growing plants because they are protected from direct overhead sun, while getting the less-intense light of first in the morning and last in the evening. Pine shade is also a type of high shade - note how a pine's branches are so high up in the sky. Low shade is shade from dense trees with low-hanging branches. The low-hanging and layered branches greatly inhibit light penetration - all day - both when the sun is overhead and in morning and late afternoon. Beech trees and evergreen trees grow in ways that create low shade. Not that many plants love low shade, but some do. In fact, under low shade other plants often don't grow. For most plants, dappled shade or high shade is the "full shade" they need, but for a few others they need more shade than that. Low shade can be turned into high shade by limbing up the lowest branches to allow more light to penetrate into the area. Or, you could selectively remove a few trees to allow more light into the areas. Limbing up branches and wise tree removal can be just the thing to encourage a reluctant hydrangea bush to flower or for encouraging hydrangea flowers to antique better than they do with no sun. Sometimes it's too deep under dense trees and the plant needs to be scooted out into a little more light. The north side of many building can be 100% opaque shade. No sunlight gets through HardiePlank or brick. The same plants that love low shade also love building shade. Plants like Illicium species are great for planting in building nooks with no direct sunlight at all. If you're in a large field, this north side of your home (building) may be the only spot of shade you have. However, if this north side is next to a driveway, pool, vehicle or anything with a reflective surface (even grass lawns reflect some sunlight), then keep in mind it may be brighter than you think. I wouldn't plant shade obligate plants if they'd be near reflective surfaces - unless you plant a first line of defense - a protective layer of trees or larger shrubs to truly make the north side a shady haven. Depending on the size of the structure, building shade can also create very nice afternoon shade (from above, buildings that are in the west). Typically, a two story building is not quite tall enough to cast comforting all afternoon shade, but office buildings, parking decks, and three story buildings - they provide nice afternoon shade for plants on their east sides. 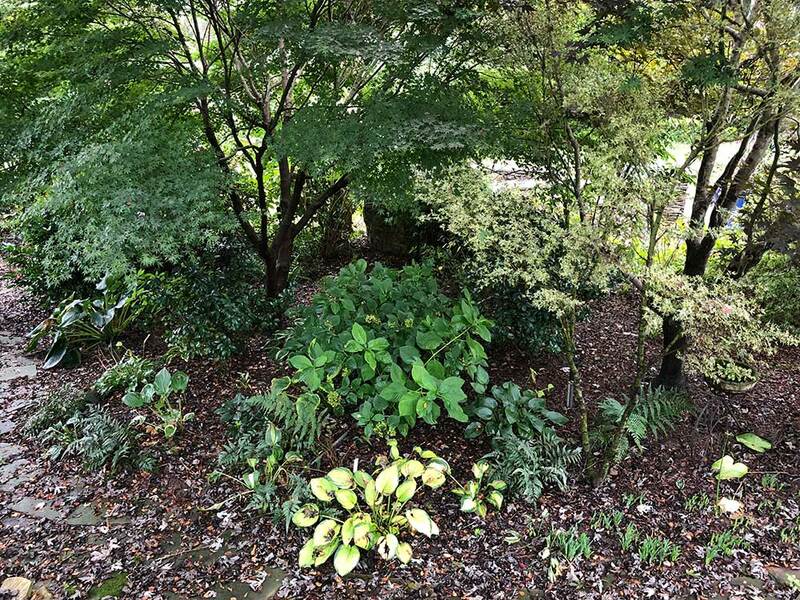 In Southeastern gardens, Aucuba japonica, Illicium floridanum, Fatsia japonica, Hosta species, and many ferns (both native and exotic) are termed "shade obligate," meaning they must have deep shade with little to no light penetration. Low shade and building shade provide the full shade these plants need. You'll hear this term "dry shade" groaned by gardeners with full shade. Situationally, all shade is dry shade, unless its a swamp. The very nature of trees make the area beneath them dryer during light rains. The leaves catch all the water or the strong roots out complete other roots and consume all the water. When gardening in the shade, it's just as important to irrigate as when plants are in full sun. Say you undoubtably know your garden is a full sun garden, but have you considered your microclimates? You may have some pockets of shade where you can tuck in a bigleaf hydrangea, Solomon's seal, Florida Sunshine anise-tree, hostas, etc. If you're planting a new find that was growing in the shade and you want to position it in a sunny local in your garden, I suggest temporary shade to help it make the transition. If the plant is dormant, you don't have to worry about this at all, but if it's fully leafed out, provide this temporary shade to prevent shock and burning: drape shade over it. Simple. Here's how simple it is. Drive a stake/stick or two into the ground and drape a screen or shade cloth over the sticks. Affordable shade cloth can be found on-line. In fact, it won't cost you much cash at all and you can reuse it for the next plant you want to temporarily screen from the sun. This temporary shade solution is not my idea. 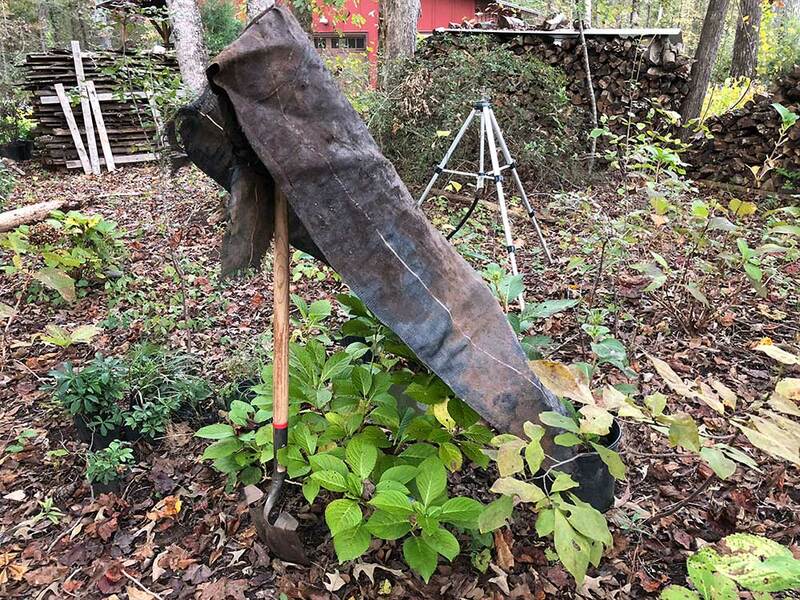 I was touring a garden and noticed a shovel driven into the ground with a screen draped over it - this contraption was shielding a Japanese maple as it adjusted to its new home. This brilliant horticultural trick I have since copied many times, but I keep my shovels in use so use sticks instead. Before you start planting, spend time in your garden. Grab a beverage, sit there. Observe the passing shadows. Observe the passing sunlight. Go out or look out your window every hour and take notes about the passing and changing shade. Remember that shade changes throughout the year. If you're studying your shade in the spring, it may be a lot sunnier in high summer. Or, it may be a lot shadier as the trees fill in. Observe all year or make educated guesses based on your knowledge of the sun's changing path in the sky. When you've figured out what type of shade you have, it will be easier to figure out where to situate your beloved new plant. We welcome your comments and questions in the blog.